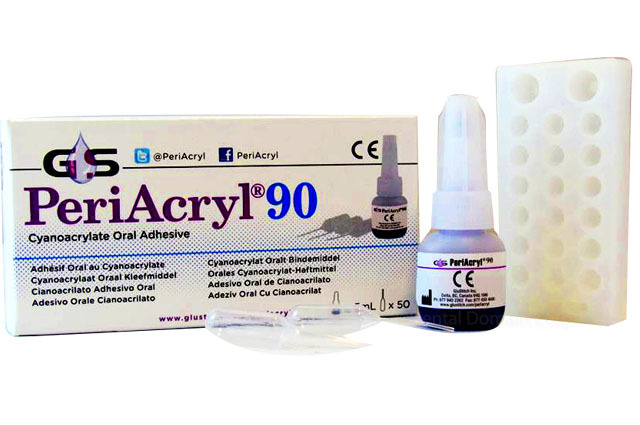 PeriAcryl 90 is a cyanoacrylate tissue adhesive that has become a popular product in oral surgery. This dental adhesive is designed to perform specifically in the oral cavity. PeriAcryl 90 is an ideal blend of n-butyl cyanoacrylate and 2-octyl cyanoacrylate that give the formulation the perfect set of properties to function on soft oral tissue. PeriAcryl 90 is intended to attach dental dressings such as COE-PAK(TM) to intact gum tissue and/or tooth enamel to help keep dressings secure and in place for up to two weeks.